TJ’s girls’ soccer team had a wonderful and exciting season. 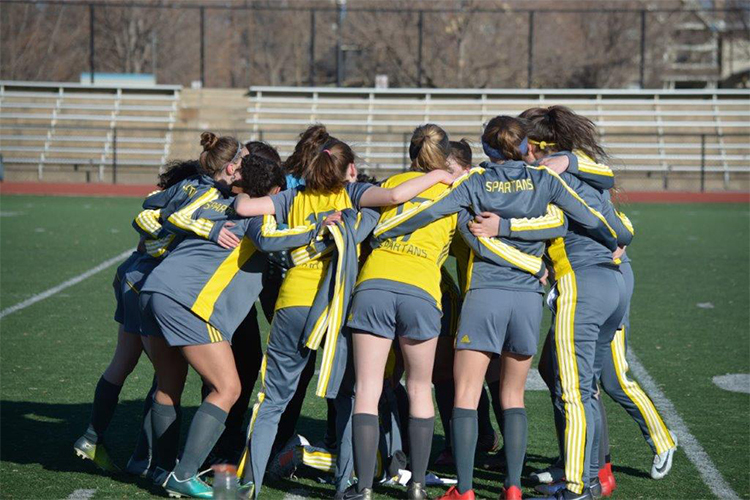 Like all spring sports at Thomas Jefferson High School, girls’ soccer had an impressive 2018 season. The team completed the regular season with an incredible record of 12 wins and only three losses. The Lady Spartans reached new heights, both individually and as a team. This season, TJ scored a total of 65 goals over the course of 15 games within their three month season. Although they were unable to beat their rival South High School in recent years, the girls beat them twice this season, which is an outstanding accomplishment for the team and coaching staff. The team can thank their new coaches for their help in making this season such a great one. Social Studies teachers Matthew McHenry and Garien Behling took on roles outside of their classrooms as new head coaches this season. “We made history in a lot of ways; we won more games than we’ve ever won in a season. The girls have a lot to be proud of; they’re a very good team,” McHenry said. The new coaches inspired the girls to reach new heights on and off the field. The junior varsity team did well, as did the varsity team. “The junior varsity team, coached by [former Spartan] Braeleh McGinnnis, had a successful winning season. They grew tremendously and had a lot of fun,” explained Behling. Megan George had ten assists and three goals. Sophomores Reece Dines and Phoebe Briney each scored eight goals this season, both showing their incredible skill, with Dines having twelve assists and Briney having seven. Although the sophomores were stars due to their statistics, the seniors helped bring the team together, initiating collaboration and creating an unbreakable bond. The team sent off their dedicated seniors, Molly Jordan Little, Vasi Reiva, and Sydney Thompson, with a beautiful ceremony on senior night on April 25th. The underclassmen presented the girls with decorated posters to congratulate them on an amazing final season at TJ. “It was a great season especially since I was able to be a part of a team that helped end my senior year in a wonderful way,” explained Thompson. Although TJ was sad to see the seniors play their last game, the underclassmen are ready to take over. The seniors and sophomores were not the only stars on the team this year. The only junior on the team, Jaelyn Jackson, scored five goals this season and had one assist, while freshman Grace Stelzer scored seven goals, and helped her teammates with nine assists. The Lady Spartans were only two spots away from making the playoffs this season, showing that the girls improved and tried their hardest. With underclassmen taking over the game, and passionate new coaches, TJ girls’ soccer has a bright future ahead.